Wool : The Circle of Life at Warp-Speed.Wool : Where Knowing is NOT Half the BattleWool : Ignorance Really is BlissWool : Proving That You're Never as Smart as You Think You AreNot only have my questions gone unanswered, but now I have new questions. Thanks Mr. Howey, I appreciate it. I don't even know if that's sarcasm coming out or not.This series of shorts is one big mind trip. I have no idea how so much is packed into so little space; it's quite crazy. But come ON - is anyone going to catch a break? Ever?!? Reviewing the Wool episodes is darn near impossible. 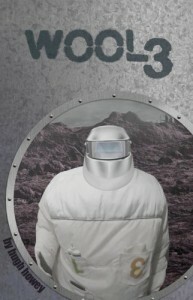 I probably had the most to say about Wool 1 when I was still new to this brand of madness. Now, I've been around the block a couple of times and it's still not old hat, even if the cycle keeps repeating itself. I just hope that someone figures out how to do something. Don't ask me what something is. I don't even know what needs to be done or if anything can be done. That's the brilliance of what's going on here. Who the hell knows?Juliette might be my favorite character so far but I also liked Lukas, her new friend who introduced her to the stars. "One," she told him. She was almost breathless from the newness of the sight. She knew what stars were - they were a part of her vocabulary - but she'd never seen one before.Unrelated to my review but...Bernard, you're an ahole. DIAF, k thanks.To anyone who's read up through Wool 3 : Wait...is Juliette still alive? I'm thinking no she's not... but she went further than anyone else! Her suit was modified secretly?